Welcome to the Anything Goes Hop! This hop is hosted by The Review Wire and The Frugal Find. All the participating blogs are offering a prize of at least $15. See all the participating blogs at the bottom of this post. Now is your chance to seek out some awesome prizes for those on your Christmas list, but hurry because the hop ends on November 24th! 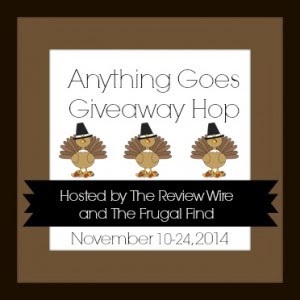 Both The Review Wire and The Frugal Find are offering a prize you don't want to miss! The Digital NuWave Oven is a revolutionary infrared cooking system. At first I was a bit intimidated taking it out of the box, but it's really easy to use! As I unwrapped the NuWave, I discovered a CD that walked me through everything from setting it up to using it to actual cooking demos. It also comes with a cookbook and a laminated cheat sheet for cooking times. The controls are digital and very simple. The infrared cooking system is radiant heat in the top cover, that penetrates foods from the inside out with a patented coating over the heating rod, making the food very moist and full of flavor. There are two bottom trays, one of which sits completely inside the other. The inner tray can be used as a cooking surface for things like cookies or it can be used as a drippings pan for things like meats. Every part of the NuWave oven is dishwasher safe, except for the cover because it contains the heating rod. The NuWave oven also comes with a wire rack. The wire rack can be used as a four inch tall rack or a one inch tall rack by just flipping it over. For taller meals, like whole chickens or turkeys, using the one inch side helps it fit under the cover. This Digital NuWave Oven from BrylaneHome also comes with an extender kit that includes a metal baking pan, another wire rack, and a plastic ring that extends the lid even taller. One of my favorite things about the NuWave oven is it can cook meats from frozen! Below is a photo of all the pieces assembled together. It's quite tall and impressive, but most impressive is the results I got from using it. I can cook delicious meats, breads, fruits, vegetables, cookies, and much more. I also can make beef jerky in it or even preheat restaurant leftovers to taste just like they did in the restaurant. It even comes with a little wire rack that clips to the side of the NuWave or sits on the kitchen counter. It's designed to hold the lid while you flip foods or serve foods for dinner. Since the cord is attached to the lid, the bottom tray can be set on the table for serving. My first use of the Digital NuWave Oven was a whole chicken, about 5 pounds. I'd already defrosted it, so it cooked just over an hour. About halfway through, when I flipped the chicken, I threw in four potatoes to cook with it. My home smelled so good! Everything cooked perfectly and I placed the entire bottom tray on the table for serving. I am so impressed with the Digital NuWave Oven. BrylaneHome always offers the newest, most convenient small appliances for my kitchen and this one is definitely a winner! Visit www.brylanehome.com for the Digital NuWave Oven and all the small appliances on your holiday wish list! Follow them on Facebook, Twitter, and Pinterest, then enter below to win. Win the Digital NuWave Oven from BrylaneHome! To enter, just fill in the Rafflecopter form below. One winner will win the Digital NuWave Oven from BrylaneHome. Giveaway is open to US residents, ages 18 and older. Giveaway ends at midnight on 11/24/2014. Good luck! Disclaimer: This giveaway ends at 11:59 PM EST on November 24, 2014. The Anything Goes Event Bloggers are not responsible for sponsors that do not fulfill their prizes. Companies and bloggers, if you would like to participate in group giveaway events like this one, sign up to be emailed about future events hosted by Review Wire Media. I entered the Cricut Explore giveaway. I'd put the Stainless Steel Kitchen Cart with Wood Breakfast Bar on my wish list! I would like to have the Hamilton Beach® Stand Mixer. I need a new one. I like the Plush Extra Wide Recliner With Storage Arms. St. Ives Media/Audio Pier Cabinet is just what I have been loking for ...for the kitchen! I really want the Over-The Door 3-Tier Basket Storage from Brylane home. The Reindeer Flannel Sheet Set is already on my wish list! Thank you for the giveaway. I just lost an hour of my life perusing that site. I love it all. A toaster oven with BURNERS?! Genius. I need one of those for our tiny little fishing cabin. I know, right? I love their website! I would love the deluxe Cuisinart® Slow Cooker! This would be a great product to cook my meals in the Winter. I have been in love with the Alexis Puff Top Printed Bedspread on their site for a few months now. I love all the ruffles. I'd like to have the 36" Battery-Operated Cordless LED Christmas Swag with Timer. Thanks. I'd love a new pan/pot set, like the 14-Pc. Stainless Steel Cookware Set with Goldtone Accents! I love the Kenzie 6-Pc. Comforter & Quilt Set Collection. I would love to have the BrylaneHome® Turbo Hand/Stand Mixer. I like their Convection/Rotisserie Toaster Oven. I would love to have the Pre-Lit Beaded Glitter Angel. They have so many great items, I would love to have some of the BrylaneHome Studio Oversized Cotton Bath Sheets. I would like the Pre-Lit Tinsel Santa. I entered the Isotoner gloves giveaway. I would like to have some of the Pre lit Curtain Panels. I would love the Essence Comforter set in Queen size. I really want a new bed set that looks nice and feels good. I want the Shark® Rotator™ Lift-Away Professional! I desperately need a new vacuum! The grill gazebo for my husband. I would love the non stick triple buffet server, it is so hard to get everything to the table warn during big dinners. I would love their Extra-Deep Lasagna Pan. I would like to have a Cuisinart Frozen Yogurt-Ice Cream Maker. I would like the E-Z Grip Ceramic Canisters, 4-pc. Set. I'd like the Cozy Microfleece Blanket in black. The Extra Wide Convertible Ottoman And Guest Bed. I figure it would come in handy for unexpected guests. I'd like to get the Shark® Rotator™ Lift-Away Professional vacuum. I would like this Non-Stick Triple Buffet Server. I could spend hours on their site.I have the Santa Fe Collection dinner set.I want the matching 20-Pc Tangy Striped Flatware. I love the extra sturdy queen size air bed! we could really use one for the holidays! I would love the taylor accent chair! I'd like to the PupSTEP Plus Pet Stairs for our family dog because I'm worried about his joints when he jumps off the couch or the bed. I would also love to get the Laundry 3-Bin Sorter. ALONA Y.
I think I would get a stand mixer or food processor! I want a kitchen aid mixer. I would like the Premier 60" TV Console. We need a new entertainment center! I'd love the Cuisinart Cordless Rechargeable Hand Blender! I'd love the animal print sherpa throw. I love the Cuisinart toaster oven broiler! The Round Pedestal Dining Table & Side Chairs (Brown) would look great in my dining room!! I didn't realize all the great products they have on their website!! I would love the Hamilton Beach 2 way brewer coffee maker. I would love to have a Hamilton Beach® Stand Mixer. I like the 3D Horse & Carriage. I would also like to have the PupSTEP Plus Pet Stairs for my furries! I'd love to have the Extra Wide Woman's Office Chair. Wow there are so many things I want on my holiday wish list from Brylane Home! Such as the Shark Rocket Professional Vacuum, the Non-Stick Triple Buffet Server, the BrylaneHome 6½ -Qt. Digital Slow Cooker, and the Extra Wide Waffle Tufted Pillowtop Recliner! I did enter Cellessence Anti-Aging giveaway. I would really like the Hamilton Beach® Programmable Crock. I would love a new crockpot-the programmable ones. I would love the Extra Wide Pillowtop Recliner with Storage Arms. i would really love to have a new recliner, a Digital Scale and some food savers. I am in need of some new bedding so I chose the Florence Oversized Comforter Collection. I thought it was so pretty. I would love to have the Cuisinart® 12 Cup Coffeemaker & Hot Water System. I would love to have the turbo stand/hand mixer. It would really help me with holiday cooking. I would love the Gaming Chair in dark brown for my husband for sure! Thanks for sharing and good luck to all! I love Brylan Home! I like the messaging recliner. It would feel good on this worn out back. I want the Electric Tri-Ribbed Warming Blanket. I would love to have their portable ice maker as I never have enough ice when company comes to visit. Their Shark® Steam and Spray is on my holiday list this season. I would like the corner laptop desk. I need my floors in my living room to be redone, so I would hope I could get the Peel-And-Stick Wood-Look Plank Flooring in the maple option for Christmas! Our living room rug is getting a bit worn, so a new one is certainly in order. The Optimum Rug would look great. All our comforters/quilts for our bed are over 20 years old and REALLY showing it!! I really like the purple Sonic oversized quilt for your bed...or maybe in orange! I'd love to have the Country Kitchen Cabinet. I need more storage. I'd love the Simon Club Chair! They have some amazing products and I like the bedroom and kitchen items most. I love almost everything they got. I would like the Cuisinart toaster oven! It would be wonderful to win this giveaway! I'd love that Panasonic Toaster Oven. I also love the Ava Oversized Embroidered Cotton Quilt & More from Brylane Home. I entered the Cricut Explorer Giveaway. Item #: 1546-19362-1168 would look great on my counter top. I'd love the Extra Wide Leather-Look Power-Lift Chair with Storage Arms. I would like the 5-Qt Slow Cooker With Insulated Tote And Lid from Brylane. I am wanting the flat to fabulous fully decorated pre lit 6' Christmas tree. As long as I'm wishing, I'll wish big! Brylane Home has a Panasonic Toaster Oven with double infrared ray heaters that's top of the line, and I would love to have it in my kitchen. I woould love to have the Electric Tri-Ribbed Warming Blanket I am freezing and likely to stay that way. I like the two-seater swing. They have soooooo much to choose from, but I really need a Cuisinart Immersion Blender. I would love to have the 42" Oak Hill Server for my dinning room. I would like to have the Digital Double Deep Fryer! I would love the BrylaneHome 6½ -Qt. Digital Slow Cooker. I like the BrylaneHome Stand Mixer! I want the Shoe 8-Shelf Rack! I would love the Bissell® SpotBot® Pet Stain Remover. A 18" Cordless LED Christmas Wreath is on my holiday list. I would like for SantaHusband to bring me the Cuisinart 14-Pc Chef's Classic Non Stick Hard Anodized Cookware! I would like to have the pressure cooker. I like the Extra Wide Leather-Look Power-Lift Chair with Storage Arms. Microfleece Bedding Collection would be on my list. I am definitely putting the Extra Wide Three-In-One Massaging Recliner Rocker on my wish list! Rachel Ellis Freer on rafflecopter. The BrylaneHome® Vertical Oven is on my wish list this year. Any of the cast iron pans or the reversible cast iron griddle. Love cast iron! For us, the Hamilton Beach® Tower Air Purifier would work wonders for our health. I would love to have the Cuisinart® Mix It in Soft Serve Ice Cream Maker. I like the Hamilton Beach® Tower Air Purifier. I would love to have there Laptop Table for when I want to do the computer away from my desk. I love the Country Kitchen Tall Cabinet! It would be so perfect in my kitchen.... along with the nuwave oven! I would like the 4-Pc Cast Iron Set. There is a beautiful rug called the Royalty Rug that is great in cranberry color. I want a Kitchen Aid stand mixer.